Deadline and Delivery – Deliver a compressed folder of your completed website, uploaded to the D2L drop box on March 3, 2016 at end of class. Send a screen shot of your home page, index.html. This is not included in your website folder. Attach compressed folder of the website folder. There should only be the content for the website and nothing else in the website folder. Compress folder – Your folder can’t be located in jump or flash drive when compressing folder. Move folder to the desktop, DataHD or your portable hard drive. Right click, select compress and an archived folder will be ready for upload. Get help with this in class. If your website is late because you can’t compress the folder, your assignment will be considered late. Make sure you understand how to compress your website folder. See this link on how to compress a file. Students will choose from a provided list of groups that have fought for civil rights in the United States. Students will then research that group, in particular the leaders of their movement for equality. Website you will be making – See it now! Website version two, full page slider – See it now! 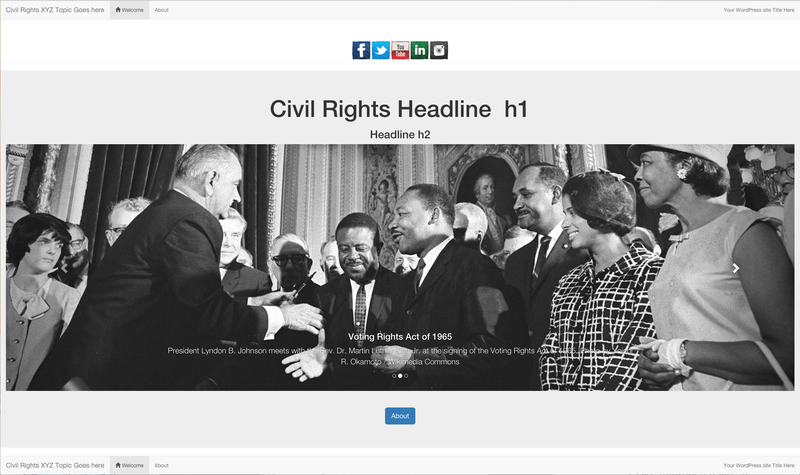 Ask for help if you want to create version two of the Civil Rights Website. Student Gallery – See websites created by students from previous semesters. There designs will be slightly different, but you can see the content and use of photos. Applications – Using Adobe Dreamweaver Creative Cloud, students will built their own website using best practices. This project will use Bootstrap from one of the Dreamweaver themes that is ready to use. Student will prepare photos to use on their website in friendly formats using Adobe Photoshop Creative Cloud. Make sure you understand how to create compressed folder for delivery. See directs listed below. You project will be late if you have not delivered project by the deadline. 1. Find your website folder, make sure it is closed, located on desktop or DataHD or portable hard drive. It can’t be located on a jump drive or flash drive. 2. Make sure all the required content is located in the folder for your website: images, css, js, fonts and pages. 3. Compress folder: Right click and press compress. An archived folder should have been created. 4. Right click to compress on Mac. 5. Ready for upload to drop box! Research and Content – What you are doing – Selecting a civil rights topic; research content for photos, videos, online information, and writing original content. This part of the Civil Right Project you will be researching and creating content for your project. This means you will select a topic, research and find photos, videos and other content. You will writing in your own words, not plagiarizing. If you select Indigenous people or Native Americans, find one leader or person you want to feature on your website. Chief Standing Bear of the Ponca Tribe argued in 1879 in a U.S. District Court in Omaha that a Native American is a person, and entitled rights and protections under the law. Get help with your project site as needed in class or email jlwalsh1@stcloudstate.edu. Content refers to the stuff on your page—text, images, videos, audio and more. You must find and edit several appropriate images, and write original text as well. Topic – Your first step is to select your subject and then do some research. For the main topoic of this project, you choose one of the following groups listed below which have worked for equality and human rights in United States. If you want to research a group not listed or is outside of the United States, please get approval from the instructor first. Get organized – Select one groups listed above to focus your project on. Read many sources and save links for reference. Create Word Document to save you information and links or an Excel file to keep your research organized. Make sure you have at three or more creditable sources, not just from Wikipedia. Write a short history or description in your own words, making a summary of what you learned from your research. Write in your own words, not plagiarism. Select one person or leader you would like to feature. Write a short biography about the person. Try to select someone that had a positive influence on civil rights. Don’t copy word by word, but make a summary of what you learned from your research, no plagiarism. Many European immigrants in the United States helped others make their way, building homes, finding or creating jobs in their new world. Here in Minnesota there is historical figure named Bishop John Ireland, 1838-1918. He helped many poor immigrants find work farming in Minnesota. He is also known to oppose racial inequality and was a civil rights supporter. Today you will find the John Ireland Boulevard in St. Paul, located near the Minnesota State Capitol. Biography for index page, home– Read as much information as you can find, then write about John Ireland, as an example, helping struggling immigrants in Minnesota related to civil rights. You should provide web links on your website for visitors to learn more about the person you are featuring and your general topic. Look for creditable resources, like the Minnesota Historical Society. About Page – See student websites for examples for the about page. All images must be cited along with the appropriate license. Banner Images must be 1600 pixels by 500 pixels. Search for photos that are related to your topic, including images of the person you are featuring in the biography. Look for 5 to 10 images. Some historical figures might only have one or two photos, but the more images you have, means a better selection for displaying on your website. Three images will be used for the banner images, but not all you select will work. Look for horizontal images for the banner images. The other photos will be used for the general description, biography and about page. You can use a photo of yourself on the about page. Look to see if the photo is in Public Domain, meaning no longer covered by copyright laws or other licenses, or if you will need to get permission from the owner to use the photograph on your website. This is your responsibility! What’s the source of your photo? Always note the source of a photograph, give credit to the photographer and source on your web page. Search for name of photographer. If you can’t find the name of the photographer, cite the website you found the photo, along with a link to the page. Here is a step by step tutorial on how to size banner image for webpage.